Recently, chance and good fortune happened to land me a 1st generation iPad mini. While very grateful for such a princely gift, I (of all people) had no use for such an Apple product. So, armed with some courage and a good story, I found a local merchant that was willing to swap me out for my choice of Android tablet. I had thought to find myself the proud owner of a 32GB Nexus 7 (2013) but at the 11th hour found myself going with the LG GPad 8.3 instead. As those of you who follow this blog might know, I am rather fond of LG’s most recent tech products (see my review of the G2 here) and thought to give their new tablet a try. Is it as outstanding a product as their flagship superphone? Read below to get my thoughts! The GPad is sharp looking device. The screen is bright and sharp, and is a great size at 8.3 inches. 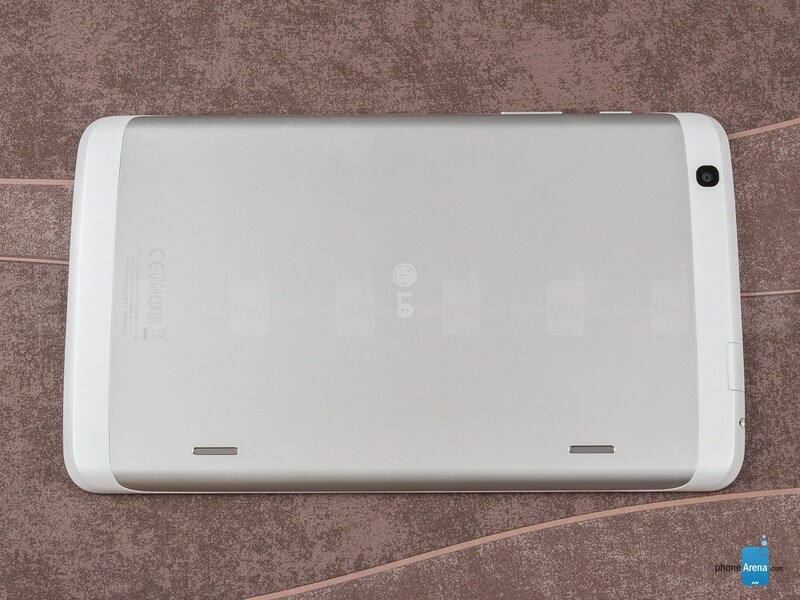 The white version is very clean looking and the aluminum back gives the tablet a very futuristic look. 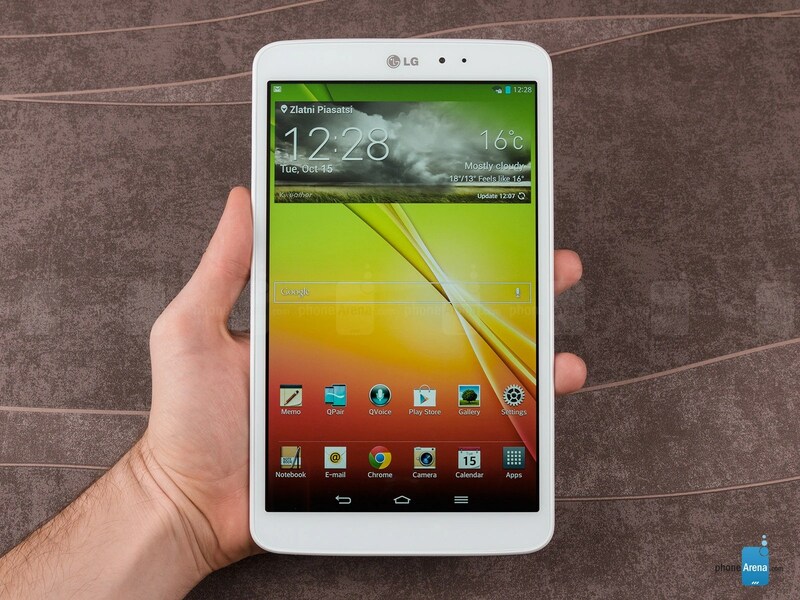 The power and volume buttons are well positioned and the LG logo on the bottom gives it the look of a supersized G2 (which isn’t a bad thing at all) It’s a little unusual looking at first, since it resides somewhere between the ultra portable 7 inch tablets and the first generation 10 inch tablets like the iPad. But the GPad is anything but a left over device. As I just finsihed mentioning, the screen and overall size of the device are great. The GPad is a light and easy to hold device, and has that premium feel. The edges are nice and rounded and make this a 1 handed device if you have average to larger than average hands. Its easy to view in both portrait and landscape positions and the device is very pleasant to hold for long periods of time watching a movie, TV show, or other video content. The aluminum back also had a nice tactile feel that gives you a good grippy surface to hold onto. The GPad is powered by a Snapdragon 600 processor, and is plenty quick to keep pace with most activity. Even though the S800 is the current standard for mobile procesors, the GPad holds its own. Its got a very large capacity battery which lasts and lasts and lasts. In standby, its not unusual for me to get well over 100 hours off of a single charge. The 16GB of internal storage is a bit of a downer, but the GPad does have an external SD card slot which helps with things like photos and music and other things you don’t want taking up your precious internal memory. And speaking of internal memory, the LG UI isn’t exactly bloat free, but most of the extra features aren’t annoying to the point of unusability. The device ships with Android 4.2.2, which should get upgraded to Kit Kat (Android 4.4) very soon. The device is simple to root (much like the G2 itself it) which opens the door to a host of other options for the power user group. The camera is just so-so, but for a tablet, it should suffice when you don’t have any other type of way to snap quick photos around. But it also does have both a front and rear camera, something the earliest generation of the Nexus 7 lacked, so there’s that. There aren’t a whole lot of accessories available for this thing still, and LG seems to have not had enough money in their marketing budget to make a huge push for this. In fact, at the time of this publishing, they’ve thrown down the gauntlet by adding 3 more tablets to their line up (some notes on that from the folks over at Droid-Life here) and the other competition in this space is fierce (Galaxy Tab Pro 8.4 info and iPad mini retina) so some more differentiation would probably serve LG quite well. Overall, this is a great tablet to use, great size, and if the pricing were about $50 less, it would be THE tablet that’s not called Nexus. Since I got mine for basically free, its a great buy. Perhaps the new generation of LG’s tablets might get a bit more marketing love than the GPad 8.3 did, and it seems that the G2 (and the soon to be released G3) got LG moving in the right direction. And while LG had previously had a reputation for slow updates, I got a notification that Kit Kat was available for my GPad the other day, and I was very excited. This also is a great thing for LG. 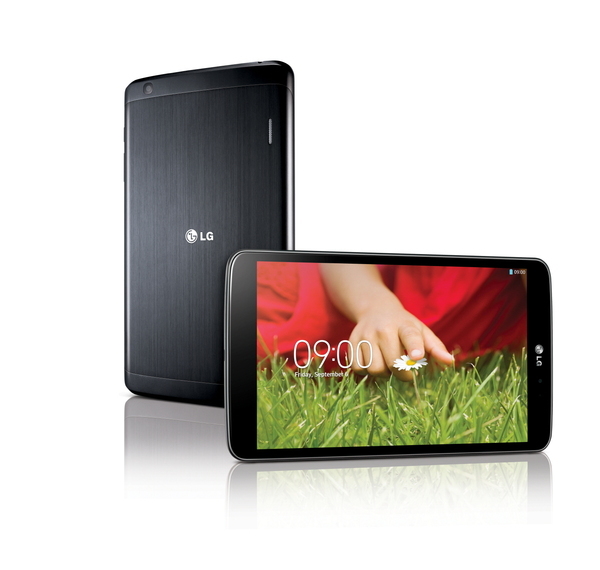 While I might feel differently if I had to pay full price for LG’s GPad 8.3, at it’s current price, its almost worth it. 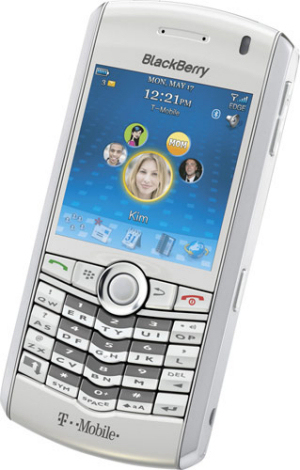 Once upon a time, I was the proud owner of a Blackberry Pearl. (Don’t laugh) I had worked my way up at a previous employer to be in a position to recommend the products the company purchased. Since mobile e-mail was king, we ended up purchasing a fleet of Blackberry devices. My first smartphone impressed me so much that when I left the company I decided to buy one for myself. I owned two before the Pearl was released, and I really though I had found the perfect smartphone for me. The size, form factor, and RIM’s e-mail integration made this a real winner in my book. Some days, I miss the feeling I had when I first got it…there’s nothing like the thrill of buying your next tech toy. This was right about the time the iPhone began to gain traction as an all touch screen smartphone that had a host of other features that a Blackberry couldn’t hope to match. So when the time came for the Incredible to go, and for a new phone choice to be made, I made a decision that would change much of the way I viewed my phone – I decided to hold out for a “developer phone” – the Galaxy Nexus from Samsung, also on Verizon Wireless. I had read that Nexus phones were among the first to get new releases of the Android OS, as well as having an unlockable boot loader and was able to be rooted (both terms at the time that didn’t hold much meaning for me). But it would give me the option to learn and experiment and allow my knowledge of what Android could do to grow. This was my first foray into the land of rooting and the Android developers community. 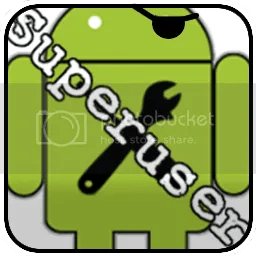 In its simplest terms, “rooting” an Android device is the ability to grant “Superuser” access to any application you choose. This would be the equivalent in the PC world of having “admin” rights to the PC. Install what you want! And if your phone offers the option of an unlockable boot loader (meaning you have the ability to overwrite even the operating system if you choose), you can do even more. You’re in complete control! The downside is of course, you also have the ability to royally screw up your phone beyond recovery (usually called bricking the phone). But I decided I wanted to learn as much as I could to make this process something that would work for me, and not against me. I made the decision to get a Galaxy Nexus for my wife and myself, and I dove into learning all I needed to know to unlock and root them both. What time I spent in learning how to do these things has resulted in my ability to make any changes I want to the software of my phone. This knowledge has given me the satisfaction of making the phone do what I want it to do. One of the developer groups making custom ROMs is known as “Team BAMF” and their motto is “Make It Your Phone.” This can easily be accomplished through the process of rooting. As an Android enthusiast, I constantly hear the strident call of those on the other side of the smartphone debate that I am “wrong” for bashing the iPhone and, along with it, iOS. 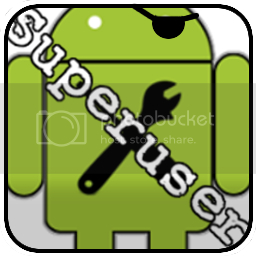 And I am happy to defend from all comers the Android platform and what I perceive as its superiority. So it came as a great blow to my personal belief system when my daytime employer suddenly was to provide me with an iPhone 5S as my work phone. This was to replace my trusty Blackberry which (let’s face it) was dying a slow hideous death. So grudgingly, I accepted my new tech, and thought this would be an ideal chance for me to give it and Apple fan boys everywhere a fair shake by spending a weekend getting to know the “real” Apple. Will I be converted? Will my passion for all things Android taint my desire to use the 5S at all? Read on to find out! 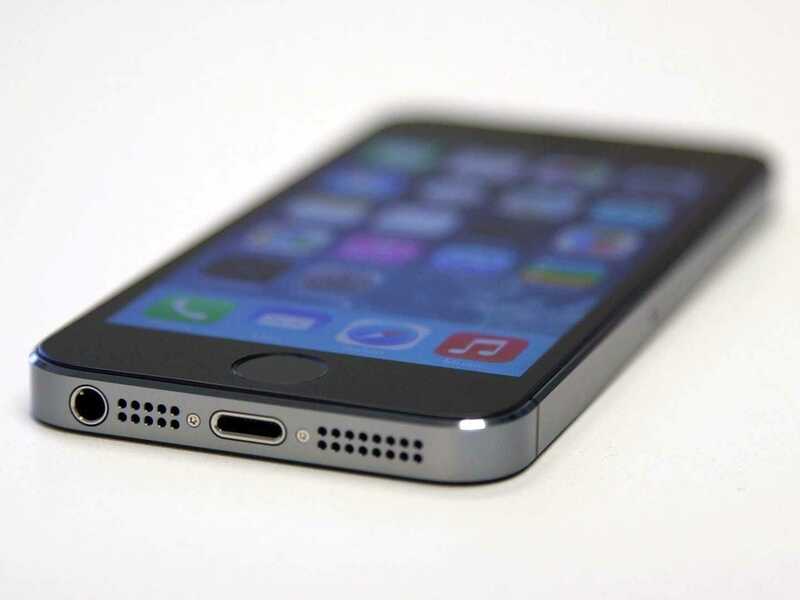 One of the areas the iPhone 5/5S shines is in terms of hardware and aesthetic appeal. You can read here how both of the Two Tech Geeks agree: the hardware design of the iPhone’s latest version of itself is well designed and crafted. 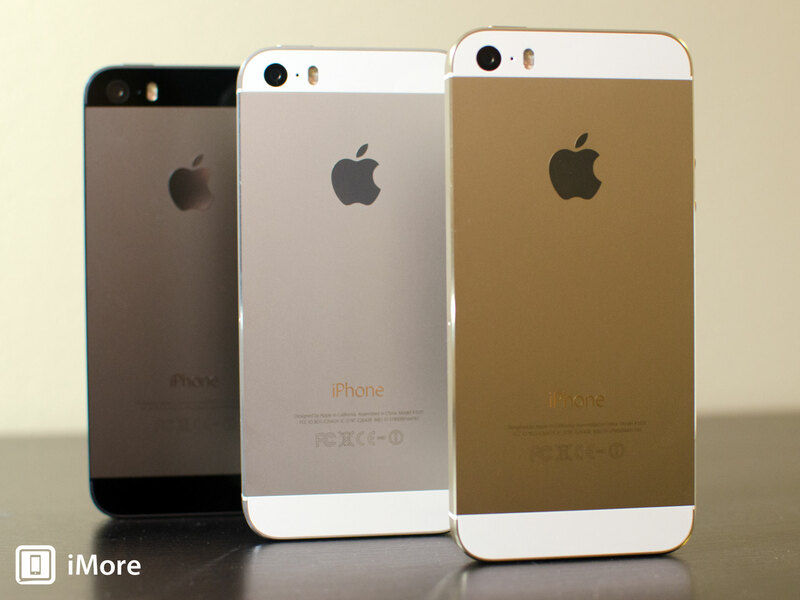 The 5S is identical in terms of hardware to the reviewed iPhone 5 and its incredibly thin, light, and premium looking. The screen is sharp, bright, and clear, and sports impressive viewing angles. Its not the largest or brightest panel on the market any longer, as many Android smartphone makers have moved well beyond the iPhone’s 4” display size. The symmetry of the design show that the folks Apple have making their handset and overseeing the quality control are doing a bang up job. Coming from a Blackberry device, its leaps and bounds better. But if you are like me and also have a current generation Android device to compare the iPhone 5S to the LG G2 the iPhone tends to look small and outdated however. If I put my current personal phone next to my current work phone, I doubt someone who is was truly objective would pick the smaller, not as bright, not as large display device. The G2 makes the iPhone look small…not the other way around. Apple has spent quite of bit of time and money in developing an iPhone that will feel in hand as good as it looks. And the iPhone 5S accomplishes this mission quite well. Picking it up and holding it for text messages, phone calls, or web surfing screams “premium device” to anyone who will listen. The rounded corers and thin profile mated with an aluminum and glass finish give it a universal appeal, and one can test this theory of how well people like it by merely looking around. I was waiting in a doctors office lobby the other morning and noticed that the other 3 people in the room with me were all on their iPhones while waiting. You don’t sell millions and millions of high end (and expensive) devices by having a phone that is bad looking or uncomfortable to hold for long periods of time. Once again, in a battle royale with my old Blackberry device, the iPhone blows it out of the water. But also once again, when compared to the latest generation of Android handsets (and the LG G2 in particular) the iPhone feels small and cramped. I dislike typing on it since the keyboard seems smashed into a tiny width and the narrow and tall portrait screen aren’t ideal for viewing most any kind of media, such as web pages or video content. Yeah, I can turn it from portrait to landscape, but I can do the same on the G2, and the G2 will still win. Listen – bigger is bigger, and in the mobile device space, bigger > smaller every time. One of the reasons I left my Droid Incredible for the Galaxy Nexus was screen size…and I then left the Galaxy Nexus for the G2 for (wait for it) screen size. The iPhone 5S feels great…but I still don’t want to use it for those things I can do on my G2 without squinting. The iPhone mantra “it just works.” I can ask anyone with an iPhone and they will give me the same answer. Looking at various Apple related message boards I can continually see something similar repeated over and over and over again: trust iOS to manage your phone for you, because it just works. Coming from the open source Android platform makes this probably the single most difficult experience of my life. Its all a matter of what you’re used to. And I’m certainly not used to letting the phone run me; in fact, quite the opposite. But I digress. My own foibles aside, the iPhone does work, after a fashion. While tied to my corporate e-mail and such, I can send and receive message easily, if somewhat obnoxiously (see my not really thrilled reaction to the iOS 7 update here) I can organize the home screen, minus any widgets of course since they don’t exist in iOS. I can move icons around but can’t put them in anything other than lined up order. No icons in just the 4 corners of the screen for you! Many of the features and inner functions of iOS seem counter-intuitive to a long time Android user, and the lack of a “back” button is mildly annoying about 43 times a day. The single home button of the iPhone 5S does serve not only double but triple and quadruple duty – starting with taking you home, and continuing through recently opened apps, Touch ID (by far and away my favorite iPhone 5S feature, more on this in a moment) and simply firing up the screen when its turned off. Ironically, with more screen real estate, Android devices have more room for multiple on screen keys, and thus eliminate the need for a “home button” and also eliminating the incredibly large bottom bezel that comes with it. Apple (much like Samsung in this respect) is loathe to give up on this legacy button since its SO much a part of how their OS works. While it can’t justify its own existence with merely software usage, it certainly can with its major hardware function: Touch ID. Touch ID deserves its own break out paragraph, so here it is. This might be the single greatest and most useful hardware innovation to go into a mobile device in years. Instead of incorporating a mobile payment service that’s not widely adopted yet or wireless charging (another personal favorite of mine) Apple instead went with an idea that is simple to discuss and has been incredibly difficult for any other hardware OEM to get right (yes I’m looking at you HTC). 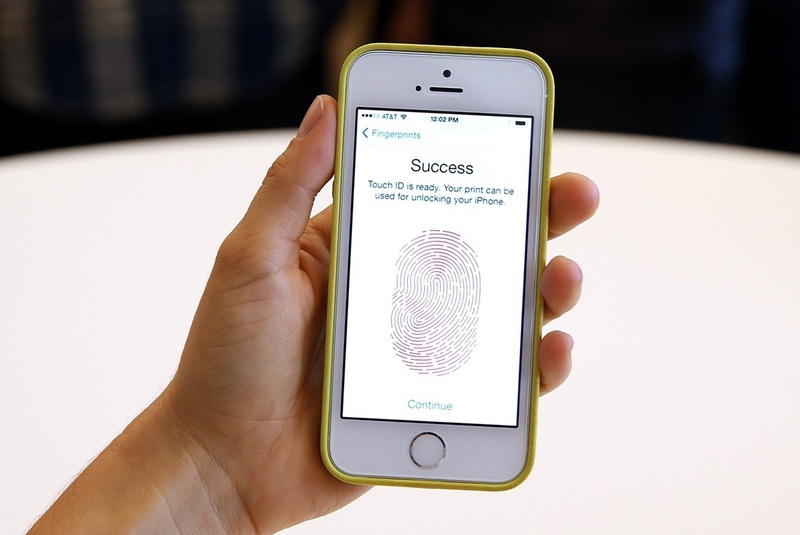 Touch ID scans your fingerprint, or multiple fingers, and retains the image to allow you to unlock the phone with a single press. This is the ID system we’ve all been waiting for. While it might be more elegant to have it integrated into the display (and reduce the bezel issue in the iPhone) the Touch ID panel in the home button, to coin a phrase, just works. You can also use this Touch ID system in lieu of passwords to make purchase in the App Store and iTunes. In case you missed it before, this thing is really, really good. iOS 7 drives very good hardware, but in my opinion the legacy of iOS as an operating system is increasingly getting left behind by a constant stream of updates and revisions that Android has undergone. Kit Kat, Android’s latest iteration, is not as far behind as it was when Android was first compared to iOS, and many of iOS’s best features are those that have been ported from Android. Bright colors and nice animations are fun, but if they don’t add any additional functionality then they don’t do anything for me. The lack of simple things like widgets is still mindboggling in the 7th version of Apple’s operating system, and one can only wonder what kind of creativity might come from having a developer community as ardent for Apple as the one that exists for Android. Open source does have some advantages…no matter what its drawbacks. And while Apple had managed to do some great things in the past – the present and future currently belong to the largest mobile operating system in the world. In comparing the iPhone 5S to my previously Blackberry device, it’s a night and day change. The old gold standard for corporate mobile devices pales when put up against the latest flagship from Apple. Issues arise when comparing the 5S to the latest devices put out by Android however. Screen size, battery life, and power/flexibility of the operating system are all categories that could be swung in favor of other mobile devices powered by Android. Other than the Touch ID system, which is clearly superior to anything else out in the market from any OEM, there isn’t a real compelling reason to choose Apple’s 5S, unless you’ve already had an iPhone for many years and are invested in their ecosystem. Rumors abound that Apple has in production a new, larger device to meet the demands of smartphone users in the United States. The iPad mini was also born in response to a market that embraced the 7 inch Android tablet with great enthusiasm. And this is the main issue with Apple recently – instead of making devices that are on the cutting edge, they are now adopting those features developed and produced on other platforms. Where Apple once led the market in the smartphone innovation space, they are now behind – and are in danger of being left behind.